A Kelvin Scottish Routemaster will return to the streets of Glasgow following a complete makeover at the BusWorks. Former RM910, but latterly Kelvin 1929, the bus arrived for its restoration at BusWorks in late October in a psuedo-Edinburgh tram livery. Over two months, 1929 was completely repanelled and internally it has been repainted, had its burgundy rexine lining panels renewed and new Treadmaster flooring fitted. 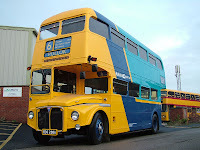 1929 is owned by Gary Conn and Martin Gurr and is part of the Glasgow Vintage Vehicle Collection at Bridgeton and the bus will be a great contrast to their 1985 built MCW Metrobus 1669 also in Kelvin livery. RM910 joined Kelvin Scottish in September 1986 and re-registered as EDS288A in March 1988, remaining in service until October 1992. A launch event was planned for the bus on 7th February 2010, almost 24 years after arriving in Glasgow. 1929's owners commented "we are both delighted by the progress and standard of work", the only detail missed is the protective grills on the bulb lighting that we asked to be ommitted. The people of Easterhouse used to pinch them! !